Home/Investigators and Research Centers/Investigators/Vicente Guillén, M.D. Dr. Guillen is a physician at IVI Las Palmas. 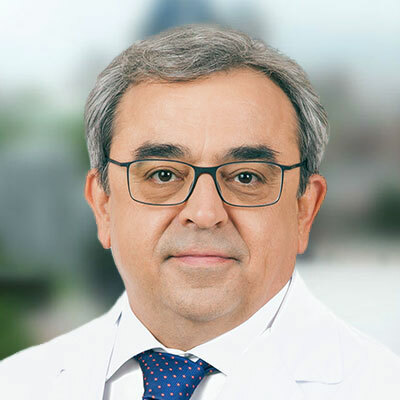 He obtained his Medical Degree from the University of Zaragoza in 1986, and completed his residency in Obstetrics and Gynecology at the Hospital Universitario materno Infantil de Canarias, in Spain, in 1994. Between 1995 and 2002, Dr. Guillen served as the supervisor and coordinator for Gynecology and Menopause services at the Hospital Universitario Materno Infantil de Canarias. Since 2002, his clinical practice focuses primarily on reproductive disroders. Since the early beginnings of his professional life, Dr Guillen has participated in numerous research projects in a number of areas, and has contributed as a autor and editor to various chapters and reference books. He has also delivered multiple presentations in regional, national and international conferences. Dr. Guillen is particuarly interested in biostatistics and health-related statistics, and is an experienced and proficient user of statistical tools such as SPSS and STATA, being able to process data for descriptive and inferential statistics and regression models. Estudio comparativo de los ciclos FIV-ICSI sometidos a coasting en el Hospital Universitario materno Infantil de Canarias. Programa de Atención a la salud afectivo-sexual y reproductiva (PASAR). Dirección General de programas Asistenciales del Servicio Canario de la Salud. ISBN: 978-84-611-9405-6, 2007. ¿Son peores los resultados perinatales en las gestaciones únicas conseguidas mediante técnicas de reproducción Asistida?. Revista Iberoamericana de Fertilidad, 22: 405-12, 2005. Endometrioma Ovárico en postmenopausia no relacionado con neoplasia ni hormonoterapia exógena. Progresos de Obstetricia y ginecología, 48:150-3, 2005. Repercusión of the hormonal substitute therapy in the antitrombin III. Repercusión Of the hormonal substitute therapy in the blood pressure. Gynecol Endocrinol, 10 (suppl 4): 273, 1996. Repercusión of estrogenotherapy whit and whithout oppsosition of progesteronq therapy in the blood pressure. Endocrinology, 10 (suppl 4): 274, 1996. Papel del antígeno de células escamosas (SCC-Ag) en el diagnóstico y tratamiento del cáncer de cervix uterino. Progresos de obstetricia y ginecología, 38:381-385, 1995. Papel del SCC como marcador tumoral en el cáncer invasivo de Cervix Uterino. Oncología, Vol 16. 7: 322, 1993. Miastenia Gravis y embarazo (a propósito de 3 casos). Progresos de Obstetricia y Ginecología, 36:413-416, 1993. Determinación de CEA, Ca 125, SCC, CA 15,3, Ca 19.9 en cáncer de endometrio.